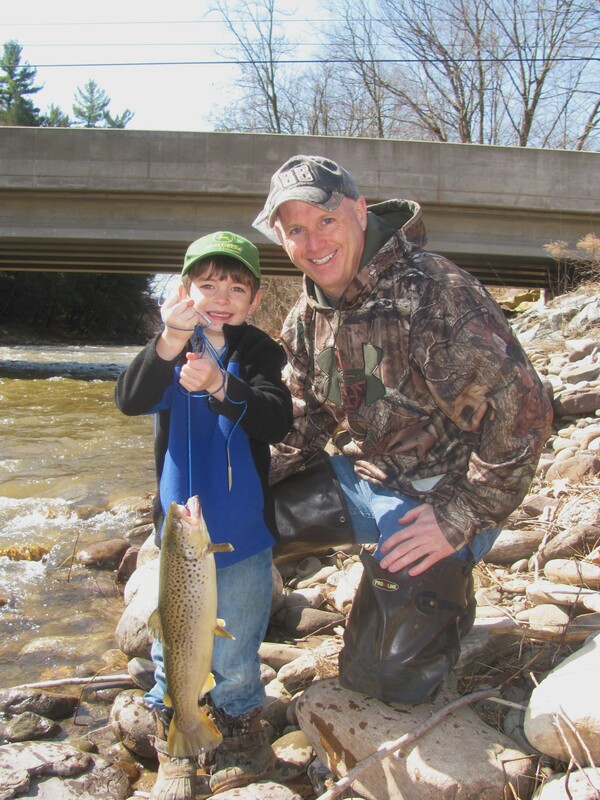 It might have been beginners luck, but six-year-old Jack Russell of Little Meadows in Susquehanna County (above, left) was the only angler to have landed a trout by midmorning at the junction of Mehoopany Creek and North Fork at Forkston Four Corners on April 12. According to his uncle, Tim Hayner of Clarks Summit, the boy had brought two more large fish to the shoreline earlier that morning, but they got away. 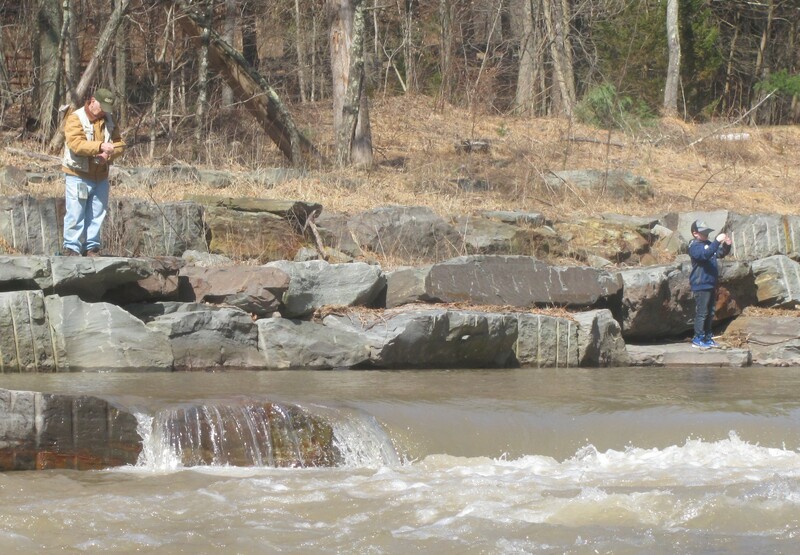 A bright morning sun quickly warmed the ravines and small valleys through which many local streams laden with state-stocked trout flowed swiftly on April 12. Anglers of all ages were eager to cast their lines into the chilly waters, despite the creeks being slightly high and turbid due to rainfall the night before. Bennett is the current president of the Mehoopany Creek Watershed Association (MCWA), members of which rolled out the welcome mat for locals and visiting anglers alike at an area along Route 87 known as Forkston Four Corners. Business was brisk at the food tent set up by MCWA members (above) in a parking area between the highway and Creek Junction Park. In another tent nearby, Bennett and his associates talked with anglers about the efforts of the organization and sold clothing embossed with the organizations logo. Welcoming fishers to the junction of the Mehoopany Creek main stem and North Fork on the first day of trout season has become a tradition that affords MCWA an opportunity to put a face on the ongoing transformation of the waterways and their banks and to raise a little money to help the organization promote itself. Any help MCWA can get this year will be appreciated. After two years in a row of successfully securing Growing Greener and FEMA grants to conduct stream reparation and erosion control projects, MCWA is not anticipating as much funding this year. Bennett related that the organization had hoped to address a large swath of Mehoopany Creek below Forkston, where the stream still meanders through fields of stone as a result of the 2011 flood. He surmises that MCWA’s unsuccessful bid for another Growing Greener grant this year was due to the scope and cost of the project, estimated at $2-million. Last year, anglers arrived to fishing holes above the bridge that crosses Farr Hollow Road that had been entirely rebuilt. Massive cut stones were positioned to shift the creek back and forth to slow its flow and to create waterfalls that feed deep pools of water. Another project employed a different engineering technique called horseshoes to slow the main stem above Forkston and replenish a few dozen acres of wetlands that drained after the 2011 flood. The anglers, many of the them from The Wyoming Valley and other parts of Pennsylvania, are quick to compliment MCWA on what the organization has so far completed. Tim Hayner of Clarks Summit, who was fishing with family and friends, said that he was impressed at what had been accomplished when he arrived in Forkston Township to fish last year. He didn’t catch any fish that day but returned on April 12 because he had heard that the streams leading to the junction had been well-stocked this year. The only angler nearby with any proof of that was his nephew Jack Russell of Little Meadows. The six-year-old had brought three large trout to the shoreline already by 10 am. Each was quite a test for the lad’s small fishing pole, but Jack had managed to get one nice, 24-inch trout onto his stringer. Len Karrott of West Wyoming and his grandson, Zachary Karrott of Pittston hadn’t had any serious bites yet by midmorning, but they were enjoying the sun and the scenery. “They’ve done a real nice job here,” said the elder Karrott. Bennett remains hopeful that grants will come through for several smaller projects this year, including a segment of Scouten Brook adjacent to Route 87 that still splits around and routinely floods a property with a cabin there. Also on the to-do list this summer is the plan to rebuilt some of the bank along the North Fork in the area of the Goodwin ball fields. The family-supported public recreation site was flooded as 38 feet of shoreline was washed away in 2011. “We filled it in some, but we want to add stone,” Bennett explained. The Mehoopany Creek Watershed Association is a non-profit organization whose goal it is “to take a wonderful place and make it better.” The watershed drains 134 square miles of streams, ponds, lakes, and marshes in parts of four counties. While largely situated in western Wyoming County, its creeks and major tributaries also take on water from parts of Colley Township in Sullivan County, Wilmot Township in Bradford County, and Fairmont, Ross and Lake Townships in Luzerne County and deposit in into the Susquehanna River at Mehoopany. To find out how to help MCWA with its efforts, interested readers can log on to www.mehoopanycreek.org. 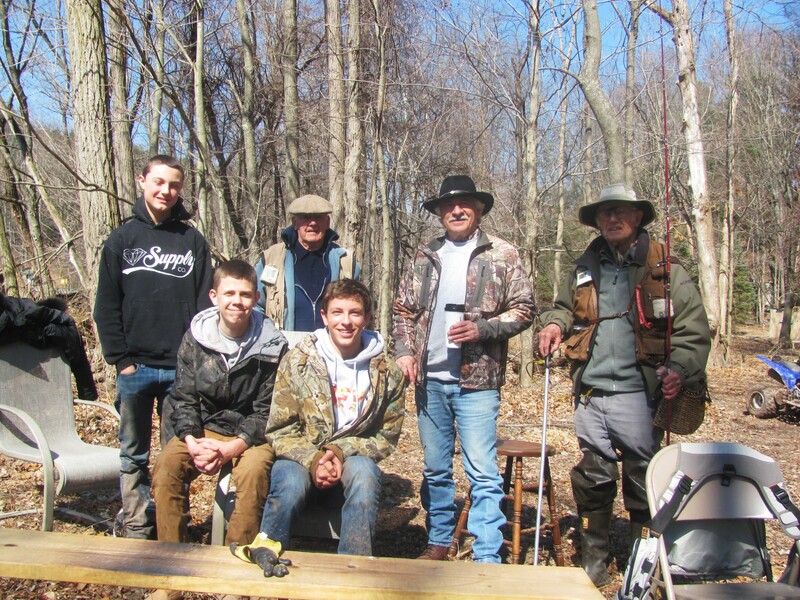 Anglers (above) fishing with Al Manganiello of Bethlehem, who owns property at the junction of Mehoopany Creek and North Fork, including (seated, left) Jimmie Lutz and Brandon Manganiello of Bethlehem, (standing, from left) Spencer Manganiello of Bethlehem, Wayne Williams of West Pittston, Al, and John Williams of West Pittston. Al has owned the property since 1983 and regards the Mehoopany Creek Watershed Association as responsible stewards of the popular fishing area. Fishing with grandpa is fun, even if the fish aren’t biting, according to Zachary Karrott (right) of Pittston. He and Len Karrott of West Wyoming were trying their luck in a stretch of North Fork along Route 87 in Forkston Township on April 12 that had been entirely rebuilt after being gouged out by the 2011 flood.